Home > Law Books > Treatises > Everytrial Criminal Defense Resource Book, 2018-2019 ed. 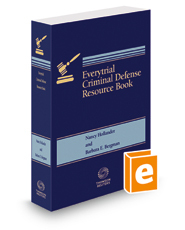 Everytrial Criminal Defense Resource Book, 2018-2019 ed. Everytrial Criminal Defense Resource Book is a versatile resource for handling setbacks in the courtroom. It includes sample motions for unusual in-trial and post-verdict situations, sample jury instructions, and suggested arguments to preserve issues for appeal. The text discusses difficult co-defendants and attorney conflicts and misconduct. It includes citations to appropriate cases and rules of evidence, procedure, and ethics.